You’ll have to forgive me, but I loooove talking about music theory. If we understand how music is put together, it unlocks a bunch of creative ideas for approaching songs in a different way and even writing our own songs. So in view of our past post “Ukulele Scales Explained for Beginners” I wanted to take a look at the differences between major, minor, diminished, and augmented chords. When we describe a chord by major, minor, diminished, or augmented we’re referring to the quality of the chord. In their simplest form, each of these chords are three note chords known as triads. The quality of these chords or triads is determined by the intervals, or space, between each note of the triad. If we recall what we learned from our explanation on scales, we can construct a major triad on the 1st, 3rd, and 5th scale degree of a major scale. Another way to think about a major triad is in terms of half steps and whole steps (see my explanation on half steps and whole steps). Between the 1st and the 3rd scale degree there are two whole steps (a major 3rd interval). Between the 3rd and 5th scale degree there is a half step and a whole step (a minor 3rd interval). If we know the major form of a chord, it’s very easy to make it into a minor chord. All we have to do is lower the 3rd degree of the chord a half step. The 1st and 5th stay the same. This gives us a whole step and a half step between the 1st and 3rd degree (a minor 3rd interval), and two whole steps between the 3rd and 5th degree (a major 3rd interval). Then, if we know a minor triad, we can easily make it diminished by lowering the 5th scale degree a half step. This means from a major triad, we’ve lower the 3rd and 5th scale degree both a half step. With a diminished triad, we’ve essentially stacked two minor 3rd intervals on top of each other, because there is a whole step and a half step between the 1st and 3rd degree (a minor 3rd interval), and then, there is a whole step and half step between the 3rd and 5th degree (another minor 3rd interval). With augmented chords, we need to go back to our major chord. An augmented chord is a major chord with the 5th degree raised a half step. This means we have two whole steps between the 1st and 3rd degree (a major 3rd interval) and two whole steps between the 3rd and 5th degree (a major 3rd interval). I’ve said it before. You can get by without knowing a whole lot of theory, but theory helps you to articulate in your mind what you’re actually playing. It’s a language that allows you as a musician and artist to communicate the things you want to communicate. On a real practical level, say you know how to play a G major chord on ukulele, but you need to know how to play a G minor chord. If you know that to make a major chord minor you only need to lower the 3rd (which in this case is a “B”) a half step, then you can find the 3rd in the chord and place your finger down a fret. If this is confusing, post your question below. Did I miss anything you’d like to add? Let’s hear it! Be sure to check out our ukulele chord library too. I’m in love with music theory, and I thought this was quite a good explanation for someone who hadn’t been exposed to any of this before. Lisa, it’s nice to have another person who loves music theory. I find it to be really helpful and interesting. Glad to hear you thought this was a good explanation! i agree…i am self taught and it has taken me months to not rely on my exceptional ear and really learn this stuff….your explanation is really helpfull! chords are the way to go! when you start understanding how to voice them in different ways it brings out a whole different quality in the sound.. again, great stuff…! i like to play a lot of older music..Fats Waller, Jelly roll Morton…not to mention classical greats. with both you need to understand this stuff but jazz and blues….you have to have a good understanding to improve with substance i also love scales. if you want to pass along some blues riffs or voicing please do. i think a lot of us will apriciate that. Hi Scott, I’ll be releasing a new resource in a couple months about scales and soloing. I think you’ll really like it. Stay tuned. thanks brett, that was a great way to explain it. I’ve done music since i was a kid but havent touched on theory for years now and all the other explainations of chords I’ve seen are very confusing, this was great and so easy to understand! thanks so much! That’s great! The elements of music theory seem to sometimes be so interconnected that it’s hard to explain one thing without explaining the other. I’m glad this was helpful! Hi. I’m pretty new to music theory, and i’m trying to understand major, minor, augmented and diminished chords and scales. What I want to know is WHY would you use a diminished/augmented chord, for example? Would this help to achieve a certain mood or feel? I have heard before that major scale is like the ‘happy’ notes, and minor sounds ‘sadder’. Are any ‘feelings’ true of augmented and diminished chords/scales? Matt, that’s a great question. You are right that major tends to be associated with a more happy mood while minor is associated with a sadder mood. To our western ears, augmented and diminished chords sound even more dissonant than minor. Often times, diminished or augmented chords are used to create tension in a piece of music. There are ways, which would be too complicated for me to get into for this comment, that you can substitute certain chords for diminished or augmented chords. The majority of music we will probably be playing on the ukulele use major or minor chords, but appropriately added diminished and augmented chords can add a cool feeling to a piece of music. I tot in playing an diminishing triads, we raise the 5th note instead of lowering it. So, thanks for the eye opening lesson. I’m learning to play the baritone uke, which is tuned to DGBE. I’d like to know more about this instrument. Most of the book sellers online go only so far, and I’d like to really get deeper into the knowledge required!. I can read music and I’ve found that in all those books on the internet, they don’t get that involved. Unfortunately, right now, I don’t have too many materials on Ukulele Tricks that focuses specifically toward baritone. The baritone ukulele is tuned like the bottom four strings of a guitar. If you’re trying to look up chords for it, the best thing to do is look at guitar chords, but only look at the bottom four strings. This will give you the chord for the baritone uke. I’ll do some more digging though to see if I can find some good baritone resources online. Yes! Exactly! I hadn’t thought of that. Jeffrey, this is a great question. Unfortunately, I don’t have anything written on 7th chords yet, but I think this would make a great future lesson. When you see a chord with “maj7” written by it (e.g. Gmaj7), it’s referring to a major 7th chord. This means that the 7th in the chord is only one half step down from the tonic/root note in the chord. So in a Gmaj7 chord, you have a normal G major triad (G, B, and D) and then your 7th note would be F#. This is because F# is only a half step down from G.
Why you would play a dominant 7th chord vs. a major 7th chord depends largely on the key you are playing in. For example, if I’m playing in the key of C major, my basic V chord in that key would be a G major. If I wanted to add a little flavor to that V chord, I might play a G7 chord instead of a G major. This works because the 7th note in a G7 is an “F” which is also in the key or scale of C major. If I were to play a Gmaj7 instead in the key of C, it would sound weird because the 7th in that chord is an F#, which isn’t natural to the key of C major. I hope this explanation isn’t too confusing. To understand this, it’s really helpful to have some theory behind scales. It sounds like you’re already diving into this stuff though. Feel free to bounce other ideas or questions off of me! Brett, your posts about the structure of minor, dim, aug, 7ths and major 7ths are really illuminating, They were pieces of the chord structure puzzle I needed. to see the whole picture. I learned keyboard theory as a child but couldn’t work out how it relates to strings; you really nailed it for me. Haven;t sorted suspended chords yet, but i’ve got plenty to go on with for now. Also an excellent explanation. Did anyone ever point out to you how clear your writing style is? Kudos to you and your teachers. It’s a nerdy observation, I know, but clarity is an important quality in this context. I’m sorry if I’ve embarrassed you, BTW. Haha, I’m glad it makes sense! I took a lot of music theory in college and got bored to death by it! It’s a nice challenge to try to explain it in a way that makes sense, so I’m glad it’s helpful. 🙂 Keep up the good work! Hey Brett, how are you doing? Julio from Brazil here. Thanks a lot for the crystal clear explanation. I am a violinist, pretty used to music theory, but I have never payed much attention to understand chords formation (it’s not very used in violin…). I reviewed Paul Hindemith’s theory book only to get more confused… Yours was the explanation that made understand the subject! So thanks a lot!!!! Hey Julio, that’s awesome to hear! Thank you for your comment. you said the notes to make up the C major chord are C, E and G, but i dont quite get it that why the C chord on the ukulele is pressing the first string third fret only? we dont need to press E and G? That’s a great question. Keep in mind that a ukulele is tuned gCEA. 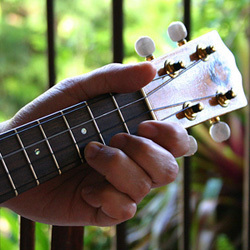 If you’ll notice, the top three strings of the ukulele are tuned to notes that are in a C major chord (G, C, E). In order to make the chord a C major chord, you have to place your finger on the 3rd fret of the bottom string. If you look at my scales lesson on C major, you’ll see that the 3rd fret of the bottom string is a C note. When you fret that bottom string, that makes all the strings that ring out GCEC, which as you’ll notice, are all notes found in a C major chord. Major chords could definitely give a triumphant feel. Minor chords too because they could create some contrast to the major chords to make the major chords stand out a little bit. A triumphant feel also is connected to the rhythm and melody of the lyric. When I think of triumphant, I think of almost a driving rhythm, with a melody that is staccato and boldly proclaimed. What makes you asked? Are you writing some music? Thanks, Brett! This lesson is really helpful because it helped me dive deeper into my knowledge of the fret board and ukulele chords! Music theory can become immediately overwhelming. Thanks for buttoning up the explanation of major, minor, diminished, and augmented chords in three easy to understand sentences. For me, it was helpful to plink out each chord variation on my keyboard. I came to the site to better understand my guitar, now I want to take on the Uke. You should definitely pick up the ukulele! I think you’ll enjoy it. So-refering to your 2nd to last paragraph up there “On the practical level. . .” if I’m playing the G Major chord on the Uke and my ring finger is on the 3rd fret, 2nd string do I move that finger to the 2nd fret to make it a minor g? Close! To make a G major chord (0232) into G minor, you need to lower the 3rd in the chord. A G major chord is spelled G-B-D. The 3rd is the middle note–the “B”. If you lower the B a half step, it becomes Bb, which makes a G minor chord G-Bb-D. In a G major chord (0232) the 3rd (the B) is located on the 2nd fret of the first or bottom string. This means you would move down a half step to the Bb note on the 1st fret of the first string to make a G minor chord (0231). in addition to my previous comment above-so does that mean that the actual note I’m playing (2nd fret, 2nd string) relates to e flat on the piano? A-C-Eb gives you an A diminished chord (Eb is the same in pitch as D#). Gb (or F#) is a diminished seventh. I don’t get into seventh intervals in this post, but as a quick explanation, in an Adim7 chord, the “A” note is the root note. A major seventh interval away from A is G#. A minor seventh interval away from A is G. A diminished seventh interval away from A is Gb. Thank you so much!! I’ve been learning this in class and I kinda got most of it, but was getting a little confused. This made it super simple. THANKS!! Well, I don’t play the ukelele at all but I have a test in music theory tomorrow and I needed to refresh my memory. You made everything SO clear for me! Thank you soo much! I study A-level music, and just thought I’d comment here saying I’ve never understood music theory so much until now. Dear god, THANK YOU! You are welcome! I’m glad it clicked for you. A dominant seventh chord is a major triad with a minor 7th scale degree added to the chord. For example, a C major triad would be C-E-G. In a C major scale, the 7th scale degree is B. Flat this scale degree (lower it a half step) and add it to your major triad and you get a C dominant 7th chord: C-E-G-Bb. In this way, the formula to make a dominant 7th chord would be 1-2-3-4-5-6-b7. Best explanation I have come across. Thanks for putting the how and the why into tout explanation. Thank you for this explanation. Trying to learn how to improvise after years of reading music, which is a lot tougher than I expected. This will definitely help and cannot wait to jam with my brother unfettered! I just started to learn music and thank you for this explanation Brett!! Finally got it!! You make it easy to understand. Could u tell me where I can get the complete chart of these four triad to easy memorize them?? If, on a C scale, F# is a diminished 5th, then why isn’t C# a diminished 2nd, or D# a diminished third? Why isn’t there such a thing as a minor 5th? Hi Jan, such excellent questions. I could go in a lot of detail, but I’ll try to give you a simple answer, which you might decide to keep exploring. For one, as a clarifying point, C diminished chord’s diminished 5th is technically referred to as a Gb rather than F#, because the “G” letter note” is the fifth letter from the “C” note. Triads are made up of the 1st-3rd-5th degree of a scale, and since the “F” letter note in an “F#” is the 4th, an “F” note can’t be apart of a C triad of any kind. Kind of a technical nuisance, but it helps provide clarity as things get more complex in the world of music theory. As a further clarifying point, Gb and F# are enharmonic tones, which mean they are both the same pitch, so you aren’t far off in referring to it that way. If you’re talking about the space in between a C to a C# note, you’re referring to the interval between the notes. From a C to C# note, it’s an interval of a minor 2nd. From a C to D, it’s an interval of a major 2nd. From C to D#, it’s an interval of a minor 3rd. I could keep going… I recommend Googling “music theory intervals” (such as http://www.musictheory.net/lessons/31). As a short answer, there is no interval of a minor 5th because that is just referred to as diminished interval. There is also no minor 6th interval, because that would be known as an augmented interval. Check out that lesson for a bit more explanation. omigod that was TREMENDOUSLY helpful! I learned how to read music 25 years ago on the piano – but was struggling to just memorize the uke chords. Now that I am reminded of these chords and their “quality” it makes sense to me and I can more easily find the finger positions! hello sir, thank u so much for the lesson, it helps me alot with the Major , Minor and Dim triad explaination, but im still new to music theory and im here for the Augemented chord ^^, so as u explain up there, the Fifth degree of the triad is raised half step, so is it ( the C Aug chord) the same to C+5? cuz im practicing a song which has a + 5 chord and im not sure im i doing right? and thanks so much for your lesson. Hi Kei, “+” or “+5” would be another way to indicate an augmented chord. Thanks friend.. now I know about the dim chords..
Hi I’d just like to know whether a C7 chord is 1,3,5 and 7? Close. In a dominant seventh chord like C7, the 7th needs to be flatted, thus 1-3-5-b7. In the case of C7, the notes would be C-E-G-Bb. What you described as 1-3-5-7 would be a maj7 chord. So, in the example of C, a Cmaj7 chord would have the notes C-E-G-B. I have been trying to figure out if the chord 1212 is an Fdim, or an Fdim7. Some ukulele chord sites don’t even give the option of diminished chords, they just include dim7s. Some chord charts have dim chords and no dim7s! I have seen 1212 called both Fdim and Fdim7. Are they the same thing? So here goes. F is ACFC. Fm lowers the third a half step so Fm is thus AbCFC. Fdim means both the third and the fifth are lowered a half step, so Fdim is AbBFB? But it isn’t, Fdim is AbDFB, right? Where does the D come from? And to make Fdim an Fdim7…..now I’m really stuck! (I realize that this is a fully diminished chord, and can be Fdim, Ddim, G#/Abdim and Bdim. I don’t get where the 7 comes in!) Thanks. First, to be clear, there is a difference between Fdim and Fdim7. You are right that an Fdim chord just has the notes: F-Ab-Cb (note: Cb is “technically” correct but the enharmonic equivalent note is a B note; so, to be simple, Cb = B). An Fdim7 chord has the added diminished seventh note, to make the notes in this chord: F-Ab-Cb-Ebb (which can also be seen as having the notes F-Ab-B-D. In this way, an Fdim7 is played 1212 on the ukulele. What’s interesting about dim7 chords is that in some pieces there is a distinction between fully diminished seventh chords, like Fdim7, and half diminished chords, like Fmin7(b5). In an Fdim7, you have an F diminished triad (F-Ab-Cb) and a diminished seventh note (Ebb = D). A diminished seventh note is one and a half steps below the tonic or root note of the chord. So, if the tonic note is F, one and a half steps down from F is a D note. In an Fmin7(b5) or F half diminished seventh chord, you have an F diminished triad (F-Ab-Cb) and a minor seventh note (Eb). The minor seventh note is only one whole step down from the tonic or root note of the chord. This means Fmin7(b5) has the notes F-Ab-Cb-Eb, and can be played as 1312 on the ukulele. I find that some ukulele chord sites don’t draw this distinction between the two and group in Fdim as really meaning an Fdim7 chord like you described. There should be a distinction. Most of the times, you aren’t going to encounter a half diminished seventh chord in ukulele music, but I wanted to provide an explanation anyways. Hi Sir, I really gain alot from your explanation and to be sincere, it’s the best I’ve seen. I’ll like you to help me explain more on steriods and tritones expecially on Gflat. Thanks. I’d say learning music theory can be a headache, but once you have an understanding of what’s going on, you find a lot more freedom and creativity in the music you play, which allows you to have fun and relax even more! Hey! Helpful article! I’m trying to wrap my head around music theory and am a newbie…. Sorry. My question is say you have a diminished or augmented chord, when you raise the 5th or lower the third respectively, will those notes be in key still? I guess for augmented does that mean your playing the 6th of the scale or is it jus a half step up and isn’t in key? Hopefully that made some sense, thanks! Great question, Chris. It sounds like you’re asking how diminished chords and augmented chords fit in with the key of a song. One thing to keep in mind is that there are different kinds of “keys”–some are major and others are minor. In a major key, such as in C major, if you build a triad on the seventh scale degree in a C major scale (a B note), you build a B diminished chord with the notes B-D-F. However, if you take a minor key, such as A harmonic minor, and build a triad on the third scale degree (a C note), you build a C augmented chord. So, in general, in major keys, there is only a diminished chord that “fits” within the major key of a song. That diminished chord is the one built off of the seventh scale degree, such as in the example above. Augmented chords don’t really “fit” within major keys, but they do minor keys, such as in the example above. However, it’s not uncommon, especially with old-timey ukulele songs, to see augmented chords in a song that is in a major key. These augmented chords technically contain notes outside of the key of the scale of the song, however, these chords tend to work and sound good because of the relationship of the augmented chord to the other chords that precede and follow that augmented chord. I wonder how a minor chord in 1st inversion is formed. I just want to know how to identify the chords if I get a notation of a song. How will I identify the chord of each measures of notation as minor or major and also which chords. Or how to identify chords on a song. any idea about chord used in electronic music?? This helped me so much thank you!! I just have one question, what happens with fully diminished with 7 triads. Things get interesting. Hah, that’s what happens! Great question. A fully diminished chord, such as a Cdim7, would be a C diminished triad (C-Eb-Gb) with a fully diminished seventh note stacked on top (Bbb, which equals an A note). The term “fully diminished” indicates that the seventh scale degree is double flatted. In the case of a Cdim7, your seventh note would be a B note double flatted (Bbb–a diminished seventh). So, take a B note, go two half steps down, and you have an A note. This gives you a Cdim7 with the notes C-Eb-Gb-A. I found your ‘simple explanation’ most difficult to follow. Are you saying that if we have a major cord, say, ‘G’, then the triad is ‘G’ plus the next two alternative notes, here ‘B’ and ‘D’? When you say lower the third degree of a cord half a step, does this mean ‘D’ and does this turn a G-major into a G-minor? If this is so, what have we gained by it in terms of musical sound? As the ‘G’ and ‘B’ are not altered, why is this not thus a D-minor? My G-string (I mean the ukulele string, not the other one) sounds quite different from yours. You explain this by saying you use gCEA. You advise to tune ‘G’ into ‘g’ but my tuner only gives a ‘G’. Have I also got this mixed up? I would appreciate your kind help. Yes, a G major chord has the notes G-B-D. These three notes create a G major triad. The third degree in a G major chord would be the B note because it’s the third note in a G major scale (G-A-B-C-D-E-F#). So, to make a G major chord a minor chord, lower the third degree a half step. This means the B note becomes a Bb, making the G minor chord G-Bb-D. In terms of musical sound, this creates a sadder sound to the chord. Minor tends to be associated with sad, while major is associated with happy. In some of my videos, I’m playing a ukulele in low G tuning, meaning the top g-string is tuned down an octave to a G note below middle C. This produces a deeper sound. If you’re tuner registers your top g-string as a G then that is correct. Thanks Brett, you are a real friend. I have to translate from Dur/Moll Terz to English which is rather difficult as the appelations of the notes and chords are also different in German; not that I understand them any better. I have been training teachers for fifty years and know a good one when I see him. I will give you a One Plus which is top marks here on a scale from one to six. Can I buy your Dummies’ Exercises directly from you as I did your ‘First Lesson and More book?’ I tried via internet but did not succeed. My reason for asking you if I could pay you directly for a copy of your exercises for dummies as I did for your courses is that Amazon America makes things so complicated for foreign orders that I can never manage to get an order off the ground because of passwords, exchange rates, postage rates, bank particulars etc. I shall be visiting Oxford, England in June so shall try to buy the two ‘Dummy’ books at one of the music shops there. I worked through your five strumming patterns and my wife told me for the first time that my ‘sounds’ were good. She even recognised my ‘Twinkle, twinkle’ and ‘Mary had a little lamb’!